Each year, when I am hit with this block of dates, I relive all over again the losses and how they happened- the hospitals, the VA, the hospices, the crises, the goodbyes, the sadness and fear and even anger. I lament the many ways that life changed with each of these losses, and I think about how I have lost the family that was my bedrock. At a time when I have begun to feel more joy and comfort in memories, and I am gaining perspective on my relationships and my experience with grief, this block of time definitely feels like a setback. I think back to when my mom died of a sudden massive heart attack, and it completely uprooted my world. My mom and I spoke many times each day, spent so much time together, and when she died I simply did not know how I would go on. For quite some time, every morning I awoke, sat on the sofa trying to decide how I would spend each day, until evening fell, and I could just get back into bed. When I did go outside, something would invariably remind me of my mom and I would break into tears. It was unbearable. Family events without my mom were traumatic. During that time, I was completing my Master’s Degree and I was hired to work with children in a hospital. I relished that time because I had to put my own grief aside for a few hours to focus on the needs of the children, which was rewarding and purposeful. Other than that, the only thing present for me was her absence. With each subsequent loss, I went through a similar process, though, sadly, I knew more of what to expect. With Ben, the levels of grief were particularly layered and they began during his battle with ALS- loss of the life as we knew it, shifts in our relationship, and, ultimately, supporting his decision to go off life support and preparing to be there for and with him as he left this world on his terms. Experience did not ease the pain of my losses by any means, but maybe it helped me to understand it and adjust more quickly to coexisting with the pain of grief. Although I did question it when I heard it, I now believe that Cinderella’s Fairy Godmother was right that “Time passed and pain turned to memory” (live action Disney Cinderella, 2015. Click here for that post). I do remember those awful days of grief. At this time of year, in particular, but also at other times, anticipated or unexpected, I still get hit by waves of grief, sadness and missing everyone. But, I also have vivid, beautiful memories of these beloved people. I look at myself and know that they have all helped to shape the person I am today. The memories are loving, and also truthful, and they have offered me a better understanding of myself and those relationships. They have led me to want to offer comfort and support to other caregivers and people in grief and to want to find and keep love in my life. I’ve come to realize that although I said goodbye, our relationships did not end. Now, I carry our memories in my heart, where they will always be to guide and inspire me and to surround me with love. It is not the same as having them here, but it is a lot. 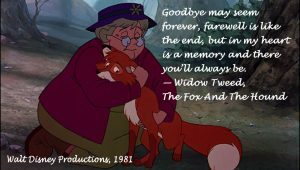 By the way, The Fox and the Hound is a truly touching story that I highly recommend. It has sweet messages about friendship, loyalty and acceptance. You have said it so well, Abby. All of these anniversaries are only a setback if you let it be. But from your writing I see how you are using the many wonderful memories you have to grow in your own understanding of “who you are”…..and in that discovery you are so honoring all the people who have been part of your life…and will continue to be. Thank you so much, as always, Maureen. We have to keep those we have lost in our hearts so we can keep their spirits alive!